← What Can You Do to Keep Your Stress Under Control? Do you have a senior loved one who’s beginning to complain about their eyesight? It’s just one of the normal challenges of aging. In many cases, however, eye problems are not very easily noticed. In fact, they’re painless, such that even your senior loved one doesn’t notice them until they’re already in the worst case scenario. Hence, it’s vital that early on, you will have at least an overview of the common eye problems that affect seniors. As a provider of Home Health Care in Des Plaines, Illinois, we partner with you in meeting the care needs of your family members at home. So, we share this brief overview of eye problems that commonly appear in the aging years. This is the eye condition characterized by a damage to the retina, thus, obstructing a person’s direct view. AMD is usually painless and slow, but when left untreated, can eventually lead to blindness. While there are treatments to delay AMD, no definite cure has been found for it. AMD is noticed by the following signs: shadowy vision in the center of sight, not being able to see what’s in front, and distorted vision. This is characterized by hazy vision or cloudy appearance in what the person is seeing. Cataract can have a gradual progress in a person’s eyesight so it doesn’t get noticed immediately. However, it tends to appear at age 40 and is considered to be the most common cause of visual loss. Cataracts can be treated depending on what stage the condition is in. The early stage will need stronger eyeglasses while the late stages will require surgery. This eye ailment comes about as a complication from diabetes when the blood vessels around the retina are affected. Like the others, it begins without being noticed but can worsen and easily affects both eyes. It can also lead to blindness. People with diabetes should watch out for this complication. 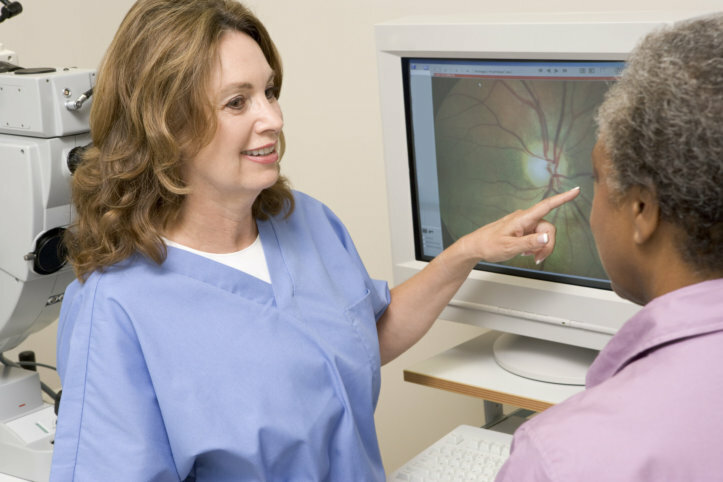 Diabetic retinopathy is incurable but treatments may be available early on. This eye disease affects the optic nerves, particularly the nerves that transmit information between the eyes and brain. There is still no pain at its onset but it becomes noticeably significant when major vision loss is experienced. Glaucoma is characterized by a visual loss at the person’s peripheral sight. Glaucoma can be treated with a prescribed medicine eye drops in order to reduce the pressure in the eye’s nerves. These are the four common vision problems that beset the seniors. However, these can be prevented when detected early on. It’s highly important that seniors have to undergo their eye checkups regularly. At Holistic Health Partners, Inc., we don’t just provide Skilled Nursing in Illinois, but we can also keep your beloved company to these important medical checkups. However, if your senior loved one already has vision loss, they can still live a quality life with assistance from our compassionate care providers. Share this information with an aging family member. This entry was posted in Vision Problems and tagged eye problems, hazy vision, health care. Bookmark the permalink.